The Gaboon Viper is located in the tropical rainforests and other moist areas of East and West Central Africa. Gaboon Vipers will usually find a nesting place in a dark place near or on the ground. They will also do most of their hunting close to the ground. They are often found in rainforests, but are not limited to them. They can also be found in savannas and grasslands, where their ability to hide and hunt is just as effective. The average length of an adult can range from 4 - 6 feet (1.21 - 1.83m). It is a heavy snake with a weight of 15 - 18 pounds (6.8 - 8.2kg). Their fangs can be from 1 - 2 inches in length. The Gaboon has a spade or leaf-shaped head with 2 horns on its snout. 1 or two triangule shaped black markings extend from their eyes to the bottom of their heads. Like many poisonous snakes, they have patterns and markings on their scaly skin. These patterns consist of angular tan, brown and black shapes, and provide excellent camouflage. This venomous snake feeds on small mammals (particularly rodents), birds and amphibians. The snake's excellent camouflage allows it to hide in decaying leaves on the forest floor, while it waits to ambush prey. It is a nocturnal snake and will hunt in the evening and at night. The Gaboon is a very venomous snake and its bite can be harmful and possibly even fatal to humans. 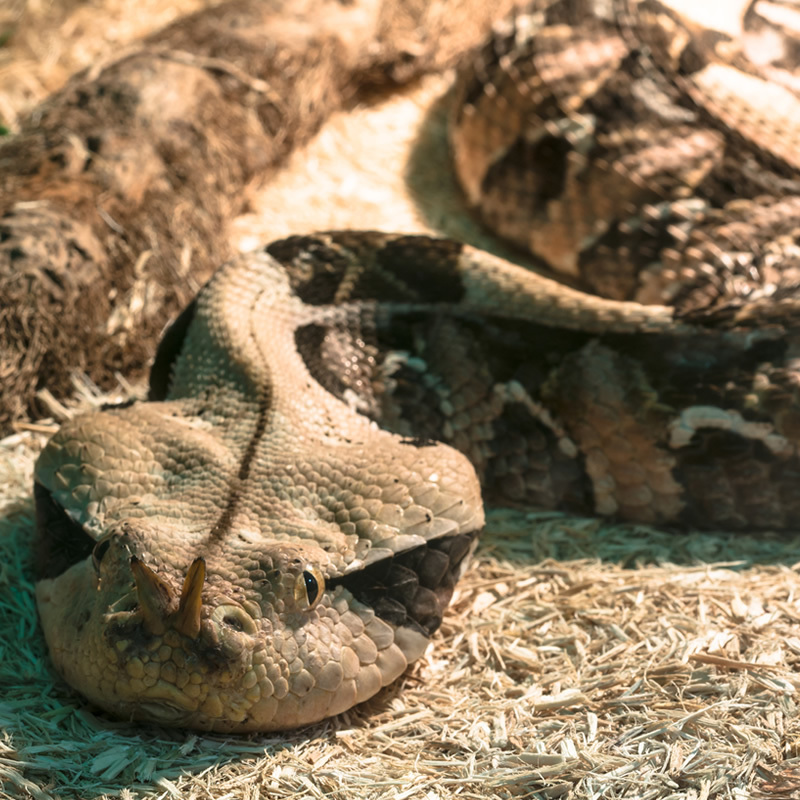 The female Gaboon Viper is viviparous, meaning it bears live young. They can give birth to 30 - 60 young during a given pregnancy.